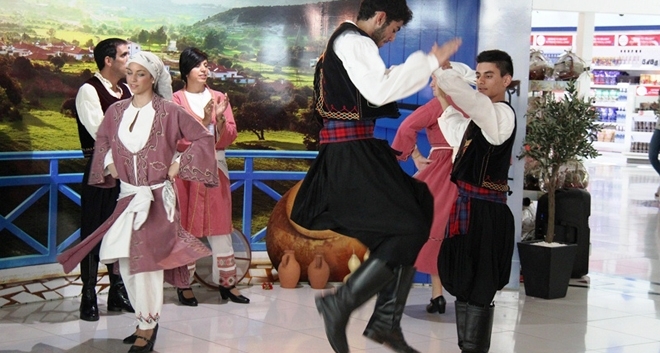 For the month of April, the departures area of the airport is hosting ‘Living Cyprus’ an event that includes traditional song and dance, food, arts and crafts created live by artists. ‘Living Cyprus’ is co-organised by CTC-ARI, the managing company for the duty free shops, Cyprus Airports Food and Beverage, the managing company for the cafes and restaurants, and airports’ operator Hermes. Speaking at the inauguration ceremony on Friday, the Chief Executive Officer of Hermes Airports, Wes Porter said he event had quickly become established, and had managed “not only to represent the beauties of Cyprus at the airport but also to gain the support and appreciation of the travelling public”. In his address, the Mayor of Larnaca, Andreas Louroutdiatis said such efforts significantly contributed to the promotion of Cypriot tradition and the tourism products of the island. Garrett Coogan, General Manager of CTC-ARI, said the event would help strengthen the brand image of Cyprus and was a reminder to all departing passengers what their holiday was all about “before they return to their everyday routine”. Odysseas Georgiou, General Manager of Cyprus Airports F&B, called the public “to seize the opportunity and enjoy the traditional dishes which will be offered at the airport’s restaurants, throughout the whole month of April as part of the event “.